On 3 March 2010 Mars Express will make its closest ever approach to Phobos, the larger of the two Martian moons. During a series of flybys, spanning six weeks, all seven instruments onboard Mars Express will be utilised to study Phobos. The close approach provides a first opportunity to perform a unique gravity experiment that may reveal the distribution of mass within this intriguing moon. ESA's Mars Express spacecraft orbits the Red Planet in a highly elliptical, polar orbit that brings it close to Phobos every five months. It is the only spacecraft, currently in orbit around Mars, whose orbit reaches far enough away from the planet to provide a close-up view of Phobos. 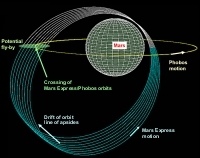 Over the course of twelve flybys, taking place between 16 February and 26 March 2010, Mars Express will pass within 1400 km of the surface of Phobos. The Mars orbiter will make its closest ever approach to Phobos- just 50 km above the surface - on 3 March 2010. The suite of seven experiments onboard Mars Express are primarily used to study the atmosphere, surface and subsurface of the Red Planet. These science instruments can also be used to investigate Phobos. During this current series of flybys all Mars Express instruments will be used to study Phobos, taking advantage of not only the close approach to the moon but also, for the gravity experiment during the closest flyby, the proximity of Mars to the Earth. Phobos, the larger of the two Martian moons, remains one of the few objects in the Solar System whose location cannot be easily explained. By studying Phobos with the Mars Express instruments scientists are hoping to contribute to the understanding of the moon's nature and origin. 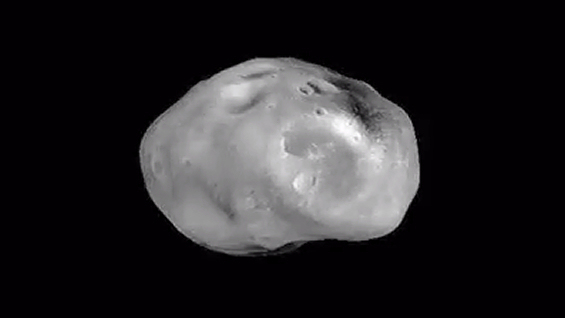 Phobos (and Deimos) could be captured asteroids – early measurements of the composition of both moons were compatible with this idea – or they could have formed from material that was ejected following a large collision with Mars. Additional theories are that the moons could be survival planetisimals, or formed from the break-up of a moon that was created early in the formation of the Solar System. Knowing how the mass is distributed within Phobos is an important step in understanding the interior of the moon and this in turn will provide crucial insight into the moon’s origin. At a distance of just 50 km above the surface of Phobos Mars Express will make the most precise measurements to date of the moon's gravity field using the X-band (8.4 GigaHertz) channel of the Mars Radio Science (MaRS) instrument. This instrument relies on the observation of the phase, amplitude, polarisation and propagation times of radio signals transmitted from the spacecraft and received at ground station antennas on Earth. The radio signals are affected by the medium through which the signals propagate, by the gravitational influence of Mars on the spacecraft and finally by the performance of the various systems involved both on the spacecraft and on ground. In addition, during this series of close flybys, the gravitational attraction of Phobos will slightly disturb the trajectory of the spacecraft. The difference between predicted trajectory (without Phobos) and the actually observed trajectory will lead to the determination of the forces acting on the spacecraft and from them the gravity field of the moon. To make these measurements, the spacecraft operates in two-way link mode with an X-band uplink and downlink. This current series of flybys happen to occur when the orbits of Earth and Mars bring them close together which means that Mars Express will be ideally positioned to maximize the signal-to-noise ratio of the two-way X-band radio-link. Nasa’s Deep Space Network (DSN) 70 metre radio station at Robledo, Spain, will track the radio signal from Mars Express and will pick up the subtle changes in the signal due to the doppler effect as the gravity of Phobos affects the spacecraft's velocity. In addition, the ESA Cebreros station will also be listening to the signal. Analysis of Mars Express data will provide key coefficients of the gravity field. The most important coefficient, the mass of Phobos, has been determined from previous flybys at higher altitudes, but it does not provide any information about how the mass is distributed. Calculation of the density of Phobos, using the mass and volume, gives a value too low to be consistent with a solid, non-porous body, which has led to speculation about the composition of the moon and about how its mass is distributed. Measurement of the gravity field coefficients from a lower altitude, as will be achieved during this series of flybys, will provide increased accuracy of the mass and allow the subsequent, smaller coefficients, such as the J2 coefficient, to be determined for the first time. To determine the mass distribution of Phobos these coefficients are required along with the libration, a measure of how Phobos rotates – this has already been determined from Mars Express HRSC images. Knowledge of these various parameters allows the three principle moments of inertia to be derived - these in turn describe the mass distribution of Phobos. Models of Phobos' interior are being developed and will be tested against the findings of the current and future close flybys. In addition to the new science performed during the gravity experiment, this series of flybys will see Mars Express build on knowledge gained from previous flybys. HRSC data obtained during previous flybys has led to the development of a new topographical atlas of Phobos (see M. Wählisch et al. (2009) for further details and the Phobos atlas website). On-going investigations include: improving the accuracy of the location of Phobos (see J. Oberst et al. (2006), V. Lainey et al. (2007), K. Willner et al. (2008), P. Rosenblatt et al. (2008)) and therefore knowledge of its constantly changing orbit as it spirals slowly towards Mars; measurements of the surface to determine its composition (see B. Gondet et al. (2008), S. Perrier et al. (2004)), study of the origin of grooves (see J. Murray et al. (2006)), shape (see K. Willner et al. (2010)) and sub-surface properties; as well as studying how the surface interacts with the solar wind. Mars Express data will provide an important contribution to understanding the nature and origin of Phobos but this alone will not provide a definitive answer. Further exploration is required, and in 2011 the Russian Phobos-Grunt (Phobos-Soil) mission is scheduled to launch to retrieve a sample from Phobos to return for study on Earth. Images taken by the Mars Express HRSC instrument during this series of flybys will be used to support the final selection of the Phobos-Grunt landing site.